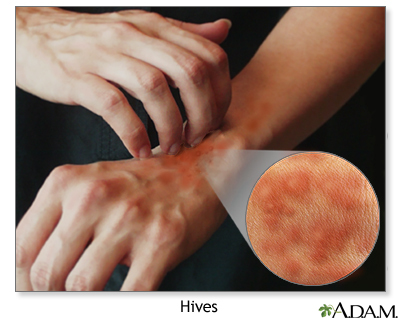 Hives are raised, often itchy, red bumps (welts) on the surface of the skin. They are usually an allergic reaction to food or medicine. They can also appear without cause. When you have an allergic reaction to a substance, your body releases histamine and other chemicals into the blood. This causes itching, swelling, and other symptoms. Hives are a common reaction. Persons with other allergies, such as hay fever, often get hives. When swelling or welts occur around the face, especially the lips and eyes, it is called angioedema. Swelling can also occur around your hands, feet, and throat. Wheals can also change shape, disappear, and reappear within minutes or hours.You know you have hives when you press the center of a wheal, it turns white. This is called blanching. If you have a history of an allergy, the diagnosis is even clearer. Sometimes, a skin biopsy or blood tests are done to confirm that you had an allergic reaction, and to test for the substance that caused the allergic response. Your provider may suggest that you take an antihistamine such as diphenhydramine (Benadryl). Follow your provider's instructions or the package instructions about how to take the medicine. Hives may be uncomfortable, but they are usually harmless and disappear on their own. In most cases, the exact cause of hives cannot be identified. When the condition lasts longer than 6 weeks, it is called chronic hives. Often, no cause can be found. Do not wear tight-fitting clothing and do not take hot baths or showers just after having hives. These can cause hives to return.